For as long as I can remember, I have had a love for animals. Growing up on a small farm on the South Shore of Massachusetts, I was involved with 4H -- competing at local state fairs with my horses and sheep. We had chickens, ducks, goats, cats and dogs -- and as the ringleader, it was always me pleading with my parents that they "needed a home". I delivered my first set of lambs when I was 13 and that experience sold me for life. I grew up and went on to receive a BA in Education and speech and language and also worked as a special education teacher. Next came marriage and 4 children in the course of 5 years which left little time for anything else. But I continuted to collect my animals -- a horse named Herman, chickens, and, of course, 2 dogs - Molly our black Labrador Retriever and Casey, our Golden Retriever. As my kids got older, we decided to add another dog -- and that's how it all started. 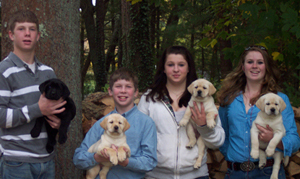 I did not show my first two dogs, but I did have a few litters while I was changing diapers and watching Barney on TV. I took this time to learn as much as I could about the breeds. Today, I show my dogs in conformation and have my first dog with a Working Certificate title and several dogs that are pointed toward their AKC Champion titles. 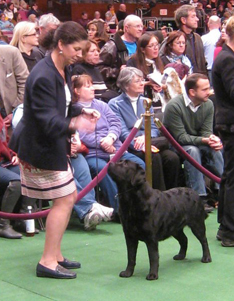 I am a member of the South Shore Kennel Club, an all breed AKC club and the Labrador Retriever Club of Greater Boston. I have been fortunate to have met some incredible people who have taken the time to saturate me with information. I still learn something new on a daily basis. I feel compelled to pass this along -- I would not be where I am now had it not been for their support and encouragement. My children have learned the good and the bad about our circle of life. My hope is they take away from this my compassion for animals and some lessons that will help them in their own adult life. Who knows -- maybe I'll get a DVM out of the pack!